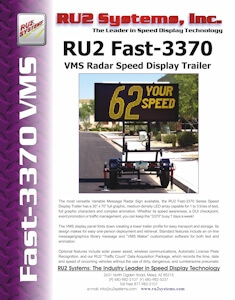 The RU2 Fast-3370 VMS Speed Display Trailer has a 30” x 70” full graphic, medium density LED array capable for 1 to 3 lines of text, full graphic characters and complex animation. The Variable Message Sign display folds down creating a lower trailer profile for easy transport and storage. 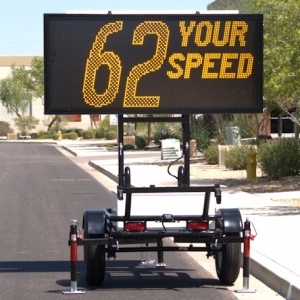 Our speed radar trailer standard features include high speed blanking, flashing digit violator alert and traffic management arrows, a basic VMS message library and customization software for both text and animation. Optional features include solar power assist, digital video photo enforcement system and, our RU2 Systems Data Acquisition Package, which records the time, date and speed of oncoming vehicles without the use of cumbersome pneumatic tubes placed across the street!